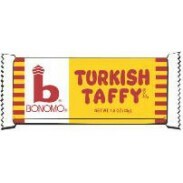 Banana, Chocolate, Strawberry, Vanilla, and Bonomo Turkish Taffy in assorted bite sizes. Shop now for bulk candy prices. 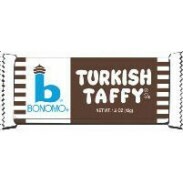 With its variety of delicious flavors and perfect balance of chewy sweetness, it’s no wonder Bonomo Turkish Taffy is the most coveted candy for so many special events and occasions. 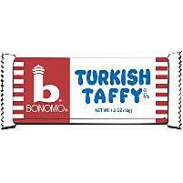 Perfect for filling candy dishes, grab bags and hand bags, enjoying at the movies, picnics, fairs, festivals beach, game nights and in front of the TV and handing out to trick or treaters, Sweet City Bonomo Turkish Taffy varieties include: Signature Turkish Taffy in Banana, Strawberry, Chocolate and Vanilla, as well as Assorted Bite Sized Turkish Taffy Change Makers and Turkish Taffy Nibblers in Banana and Vanilla. Bonomo's old-time candies bring back memories of boardwalks and seaside carnivals of yore.